Compatibility: Community, but does have a justified reputation as a fin-nipper. This tendency is reduced when kept in a shoal (much like Tiger barbs). Avoid mixing with vulnerable long-finned fish such as male Guppies. Water chemistry: Around neutral pH (6.5-7.5). soft to medium hard. Feeding: Omnivorous: small live, frozen and dry foods. Sexing: Males are smaller and slimmer. Breeding: Use a small breeding tank with fine-leaved plants. Eggs will be scattered among the plants. The fry will hatch in around 24-30 hours. 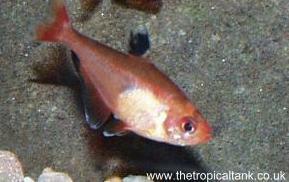 Comments: This is one of a complex of species sometimes known as "Blood Tetras" or "Blood Characins".